Health information technology, especially EHRs, has the potential to improve diagnosis by offering quicker access to patient data and reference information. Much remains to be understood about how the work of physicians has been transformed by EHRs, and particularly the impact of EHRs on diagnostic processes. VA’s upcoming EHR transition will further affect diagnostic processes. The National Academy of Medicine highlights the harmful effects of diagnostic errors in their report, Improving Diagnosis in Health Care. The report defnes diagnostic error as “the failure to a) establish an accurate and timely explanation of the patient’s health problem(s), or b) communicate that explanation to the patient.” Without timely and accurate explanations of their health problems, patients will not receive the treatment they need when they need it. We previously estimated that diagnostic errors affect 12 million U.S. adults per year (or approximately 1 in 20 adults) in outpatient settings alone.1 This extrapolates to an estimate that at least 1 million Veterans could experience diagnostic errors every year. This fgure is likely an underestimate because Veterans may be disproportionately affected by diagnostic errors due to the presence of more medical conditions. However, EHRs have also fundamentally transformed the way physicians do their work. Evidence from physician interviews suggests that EHR use might worsen cognitive performance, for example, by diverting attention away from the primary task of diagnosis, making information access burdensome, reducing attention to detail, worsening situation awareness, degrading communication, and requiring the input of overly comprehensive and fragmented pieces of information instead of richly organized narratives made of noteworthy information. The reality is that most EHRs were developed as billing agents and physician attention is often diverted away from making diagnoses as physicians spend substantial time documenting for reimbursement purposes. Documentation requirements lead to copying and pasting, and the ease by which information can be easily entered and transferred in the EHR could lead to superfuous information. Clinicians experience consequences of information overload, sometimes leading them to miss abnormal test results or critical clinical fndings in the EHR. Additionally, the way information is displayed across EHRs is not standardized, and some EHRs make tracking of information over time diffcult. Overall, there is less time spent with patients at the bedside, which has also possibly led to the decay of bedside diagnostic skills. Making accurate diagnoses in the EHR environment might also depend on how clinicians use the EHR for diagnosis. Variation in EHR use patterns may occur from physician to physician and by clinical experience. For example, we might expect to see variation in the breadth or depth of search for diagnostic data such as historical lab values, in the use of templates and copy or paste functions, or in the creation of tabular versus graphical displays to assess trends in lab results. We thus hypothesize that how physicians use the EHR is also a key factor in understanding and reducing diagnostic error. Identifying patterns of EHR use that facilitate accurate diagnosis may enable us to develop future interventions to improve diagnostic decision making using the EHR. Much remains to be understood about how physicians’ work has been transformed by EHRs and the ramifcations of that transformation on diagnosis. VA’s upcoming EHR transition will further impact the diagnostic process, necessitating a rigorous examination of this area. A better exploration of these issues can guide implementation of effective interventions in health services delivery, ultimately improving diagnosis in the EHR environment. In a newly funded HSR&D career development award, we will embark on a multi-year research project to understand how physicians use the EHR to diagnose patients and how we can improve EHR use to improve diagnosis for Veterans. Themes included will be EHR documentation, information overload, information seeking, metacognition (thinking about one’s thinking), situation awareness, and other factors that might play key roles in diagnostic error. We will use Naturalistic Decision Making (NDM) methods and simulation to examine how physicians use the EHR as they diagnose standardized patients. NDM involves the study of cognition in natural settings, especially cognition performed in dynamic conditions with time pressure, uncertainty, organizational constraints, and high stakes (in contrast to tightly controlled, experimental studies performed in a laboratory). Our research will examine diagnostic decision making in a more naturalistic environment, taking into consideration both contextual and patient-related issues using NDM methods, while also allowing us to examine cognition during diagnostic decision making in a relatively controlled setting. We will then observe physician behaviors inside and outside of the EHR (for example, actions taken navigating the EHR, but also actions taken outside of the EHR, such as talking to patients). During this time, we will collect time and motion data, from which we can identify patterns of EHR use related to diagnostic accuracy. 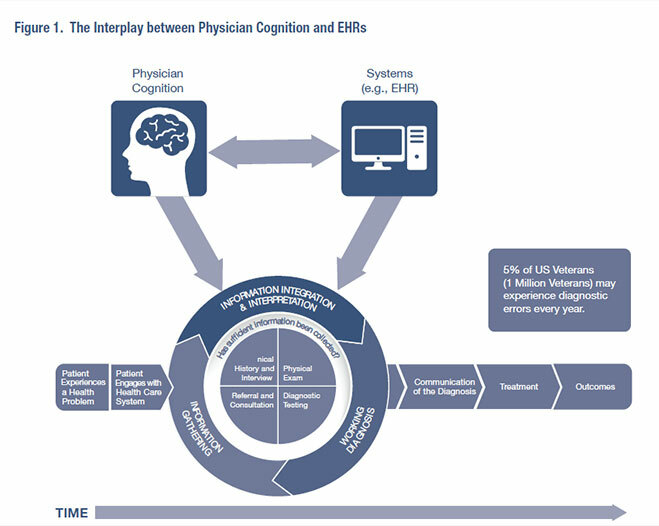 This information could be used to generate new knowledge on how to provide feedback to physicians about ways to better incorporate the EHR into their diagnostic decision making in order to improve diagnostic accuracy for the Veterans they treat. While EHRs promise quicker access to information, along with improved coordination and continuity of care, understanding their potential pitfalls and how we can overcome them is necessary to improve diagnosis. We consider this one of the most timely and exciting opportunities for health services researchers. Adapted from National Academy of Medicine Report, Improving Diagnosis in Health Care, 2015. Singh H, Meyer AN, Thomas EJ. “The Frequency of Diag­nostic Errors in Outpatient Care: Estimations from Three Large Observational Studies Involving US Adult Popula­tions,” BMJ Quality & Safety 2014; 23(9):727-31. Graber ML, Byrne C, Johnston D. “The Impact of Electronic Health Records on Diagnosis,” Diagnosis (Berl). 2017; 4(4):211-23. El-Kareh R, Hasan O, Schiff GD. “Use of Health Information Technology to Reduce Diagnostic Errors,” BMJ Quality & Safety 2013; 22(Suppl 2):ii40-ii51.